The year 2017 proved NewAer continues to innovate and to remix proximity technology by placing Bluetooth beacons on people rather than the store shelves that they were envisioned for. For SXSW we put Bluvision beacons on guests at SXSW to create what Techcrunch called Minority Report, but we felt was more like “Six degrees of separation.” Attendees within the lounge could quickly append their Facebook “likes and profile” to a BLE beacon, which would create useful interactions around the event to show how everyone was connected in the real world. But this was more than a demo, the interaction and screens can be setup by you today using our NewAer Kiosk application! The best part about this interaction was that it was heads-up. Many of the breakout SXSW apps in the past have required users to look down at devices, and we wanted to change that to keep people looking up. The owners of Bluevision and HID, ASSA ABLOY said in their newsletter that our “identity software is the equivalent of a web cookie” in the real world. Our innovation continued at CES with news that we will be able to share in the coming weeks. In the mean time, check out our video from the SXSW experience sponsored by Walmart in the Capital Factory! Here’s to an action packed 2018! If you want to download our SDK to dig deeper into our framework of device detection and communication, just click here! 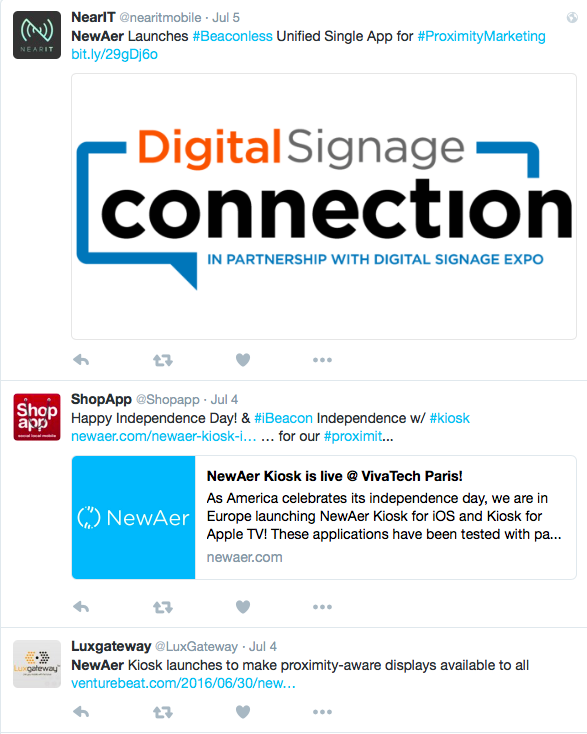 As America celebrates its independence day, we are in Europe launching NewAer Kiosk for iOS and Kiosk for Apple TV! These applications have been tested with partners over the last year, to enable direct messaging of content to users standing in front of your digital displays within your office, mall or airport! Thanks goes out to the team at VivaTech Technology Paris for having the platform for us to debut Kiosk in the keynote “Geolocation: augmented experience or personal intrusion? Are beacons failing?” on Friday the 1st, 2016 to a full audience! It works like this… By plugging an Apple TV running Kiosk into any television display or running Kiosk on an iPad Mini at a POS (Point of Sale) or an iPad Air at an end-cap or within a kiosk stand, you can develop web apps that are triggered from the proximity to a users phone running the same app, instead of building full native iOS applications on the iBeacon standard. And once users download the unified application Kiosk, they have to allow your screen to see their presence, so it’s private from a user standpoint. Only when they opt-in can they engage with your sign. Our press release on Kiosk is here, and the download can happen from the links above or searching NewAer in the iTunes stores on your iPhone, iPad or Apple TV! The team At NewAer loves the term automagic. It’s what drives us to build our software. It means whatever devices within your environment know the context of other devices in the space around you. This means that services attached to those digital things can anticipate your needs. We are used to having this in the web world online with Cookies. They remember our passwords and what you have placed in shopping carts online. Since most of us can leave our homes without forgetting a smartphone these days, yet comfortably overlook bringing keys or a wallet, we think that the mobile phone as a key to your digital life is the right idea. This is the basis for what we call anticipatory computing. So for our digital world to really hum along, we need automagic, anticipatory computing made possible by a “cookie for the real world.” This is the big idea that we’ve been working on. Think about an implementation like this: You walk into your home, and the lighting and music are curated just for you, nearly like Bill Gates’ house did with custom equipment and programming that only he could afford in 1996. That type of automation is still not happening today, 20 years later. When you tell a voice interface like Amazon Echo or Apple Siri to play your favorite music, these only follow voice recognition, not the identity of who’s speaking. That means the device is registered to only one account and has no idea if it should play your favorite songs, or the person who lives with you. Some voice interfaces even ask you to read a pin aloud if you switch users. Talk about archaic. Logins and pins should happen in the background with proximity measurement of radio waves like NewAer offers. Furthermore, if the world of Virtual Reality picks up for gaming like we think it will, there is no better way to add your nearby friends as characters into the game you are playing than by using a platform like the NewAer SDK. Instead of scanning barcodes like the app Snapchat or the old messenger BBM does, proximity onboarding just happens automatically in the digital world when someone approaches you in the physical world. Again, the ultimate hands-free experience by using our SDK of Blue Tooth Low Energy to detect an identity within the virtual world. This summer we are speaking and debuting software at Founders Forum in London, VivaTech in Paris, Tech Open Air in Berlin, and are meeting with our licensing partners in cities all over Europe. 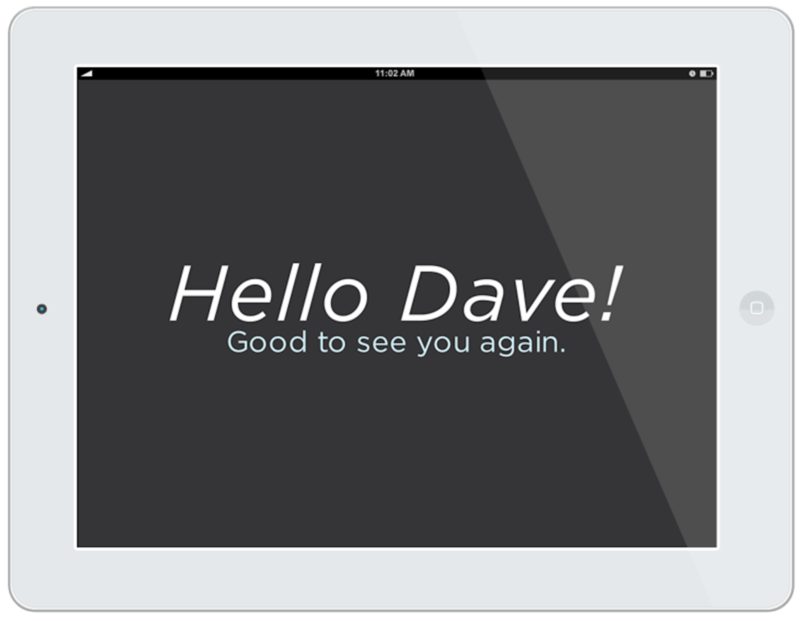 We’d love to talk to you about proximity and how we can make your mobile experiences automagical. Just click the Contact button and let us know where you are and lets meet on our European 2016 tour! In the mean time, take a look at our Proximity Platform SDK by registering and downloading our software! It’s free for the first million API calls. Every year we look back at the progress that we have made with NewAer and see how we can ease future adoption for our end-users. This year was fruitful for us but taxing on the industry. For companies in the space of retail analytics, shopper marketing and beacons the year did not have the explosive growth that the industry projected. The complexity of iBeacon from software integration and hardware deployment has been limited to trials with no breakthrough successes found. Short of buying sample kits for testing, the effort of deploying beacon hardware plus the required installation at retail; then asking those teams who don’t really understand it to maintain this new digital equipment have hampered widespread rollout. Further more, the industry has not made its own development easy with even major advertisers asking us who to choose. It is common for us to hear quotes like “we have software developer kits from 10 companies to choose from, who is going to be the winner?” Meaning for them, integration with a third-party SDK is required inside of their app that must be then promoted for downloads in order for users to interact with that space. Confusion abounds. When it comes down to it, few people in stores with smartphones are downloading applications for that store; which is how the iBeacon protocol is deployed and secured within iOS. Due to these complexities, we have seen our industry peers lose senior staff; incur company layoffs, even closures and pivoting for companies in this space. Even Apple is not talking much about iBeacon at their developer conferences. We think that we have built the solution to these problems called NewAer.com/Kiosk which we will launch with partners in 2016. For a trial of this software, please contact us. First, we announced support for the Apple TV 4th generation hardware. This means that interactive proximity signage can be as simple as installing a $149 device on a screen that already exists in your retail environment. Second, we announced a project with Lufthansa allowing traveling unaccompanied minors the ability to connect and communicate without WiFi or Cellular connectivity. Now young travelers carrying iPads without LTE coverage and children with an iPod Touch can stay connected with the Lufthansa Super JetFriends application and the Kiosks located throughout German Airports in the Unaccompanied Minors areas. The NewAer peer-to-peer Proximity Platform is key to providing our customers what they want. Whether it is a consumer goods company like Unilever who wants to reach the next billion users without mobile connectivity in Africa and India, or the global airline Lufthansa who wants keep roaming international travelers connected, never has it been so easy to communicate between smartphones, tablets or computers driving digital signage. January 4th, SDK 5.0 at CES with iOS Peer-to-peer messaging. June 24th – Cross compatibility between Android and iOS devices as our SDK can now communicate peer to peer over Bluetooth Smart running on those devices. October 3rd – We debuted our Kiosk application which was selected by Advertising Week in New York as a breakout product for the event. November 7th – The industry anticipated new Apple TV shipped and our NewAer SDK began running on the 4th Gen Apple TV hours after it was received in our offices. December 23rd – Lufthansa launched Super JetFriends using our platform to connect the disconnected travelers who do not have roaming cellular service, nor connect on WiFi. And as we wrap 2015, we look at the future with 2016. There is no doubt that taxed cellular networks in the 1st world countries will leverage lower range technologies like Bluetooth Low Energy and WiFi to augment their services. Many developing countries will go straight to these technologies as a lower-cost hub-and-spoke replacement over LTE and its costly licensed infrastructure. Our Proximity Platform is perfectly situated for these two types of deployment for in-space messaging. Dave and the NewAer Team! 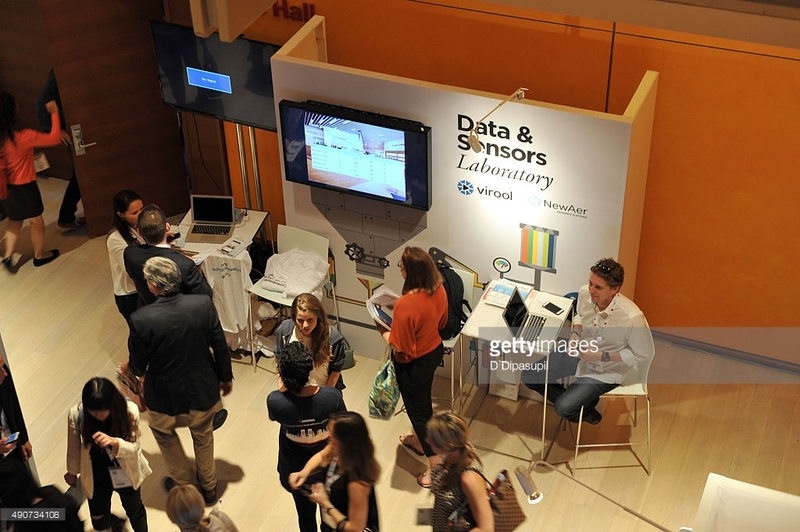 The producers of Advertising Week invited us along with less than a handful of other innovative startups to present in their Data & Sensor Lab at the Time Center this week. We showed how we are powering large screens in public places like airports and malls for relevant marketing to those who walk with their smartphones in front of the screen. 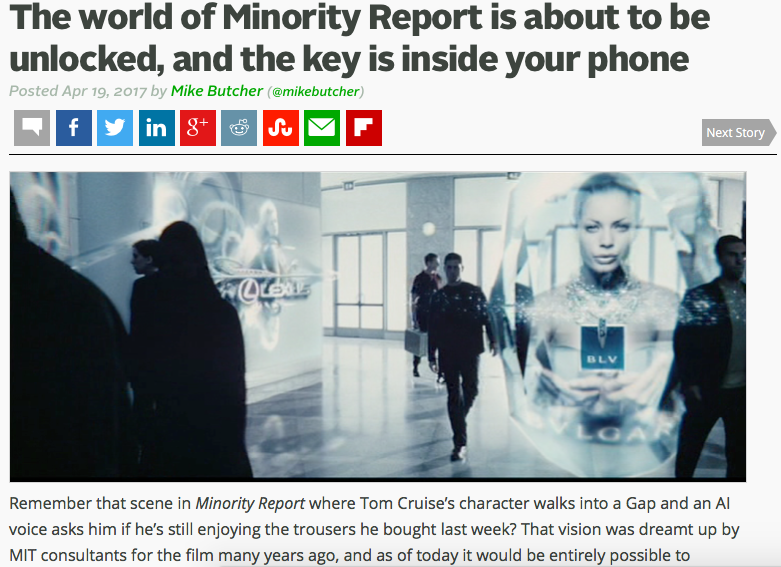 Much like the movie Minority Report did by using Hollywood trickery and somewhat creepy eyeball detection. With our system, users would opt-in to such messaging and “range in” on a sign with their wearable, vehicle or smartphone. Once the screen running our Kiosk application detects the user presence, some automated action would happen. Examples of such are gate information for flights would be displayed if the user has the companion app with this enabled. A vehicle with integrated Bluetooth or WiFi would let a drive-thu order be replayed a second time, or a hotelier may send you directly to the correct room upon walking into the lobby. 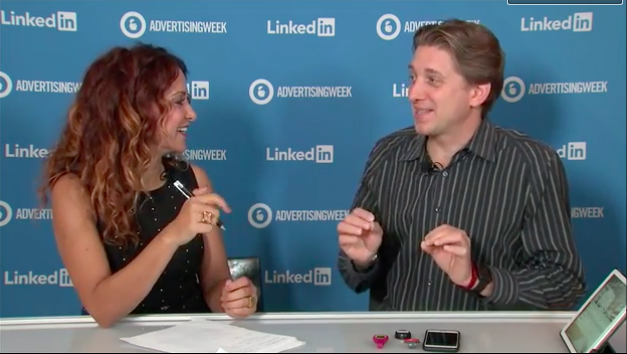 From the Time Center stage, Linked-In had a presence with great interviews from companies in the advertising space. We just happened to spend some time talking about what we are up to as well. If you’d like to learn more about Kiosk, built on the NewAer Proximity Platform, just click here and read all about it! Thanks for all of the visitors who stopped by and said hello at Advertising Week! 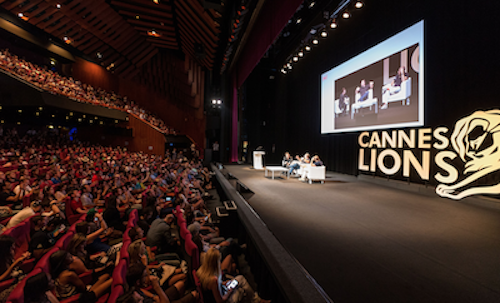 We are at Cannes Lions with the Unilever Foundry this week, where we made our debut of our partnership with Magnum last year. This year we are chosen as one of the top companies from their Foundry 50 team. If you are here thinking of iBeacons or proximity based projects, lets meet up! I suggest we meet at the Carlton Hotel via our friends from Eventbase with their iBeacon and Wearable app Rose Time! This is a big event for us, and we are celebrating it with the launch our latest software developer kit which lets Android support Bluetooth Low Energy communications between iOS, OSX and Windows! Our now five-year-old startup might not be quite so new, but we are happy to continue to be the lead pioneer in the industry with version 5.1 of our software. It is no secret that iBeacon uptake has been slow, even Apple hasn’t been focusing on it during their past World Wide Developer Conferences. We have our ideas on this, as does Innometrics, but our focus on being a utility with the bonus that NewAer requires no new hardware is helping us lead the charge on the category of proximity that we were first to bring to market. 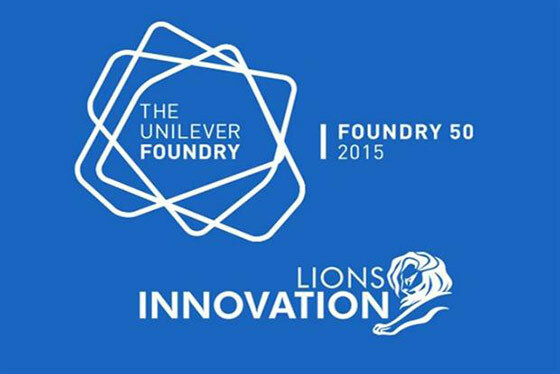 We are happy to be announced one of the Unilever Foundry partners at the 2015 Cannes Lions. We have achieved the impossible – Android 4.3 and up can broadcast their presence over Bluetooth low energy to an iOS device. This is something that Android and Apple mobile operating systems cannot support due to OS level software limitations. Originally, we gave Android the ability to detect all beaconing devices, now we can communicate a device presence to an iPhone or iPad in a peer-to-peer off-cellular Bluetooth Smart connection. Hurrah! Devices running our SDK on Android, OSX or Windows can see any disconnected WiFi access point, as well as Bluetooth 2.0 devices like cars and laptops. For iOS discoverability of radios is limited to just BTLE devices and connected WiFi access points. The second huge feature our SDK enables is that iOS devices can now receive these signals from our back end cloud-based Proximity server. This means your iOS apps can “see” disconnected WiFI access points and Bluetooth 2.0 devices when one of the above devices is nearby. Boom! The introduction of our version 5 SDK in February meant your apps will never be left in the dark with their radio environment when they lost cellular connectivity. With NewAer, all of this works without the installation of beacons, as we use any WiFi or Bluetooth devices that are already within an environment. That’s right, your printer, 3D TV, WiFi access point can become beacons. Additionally any nearby phones and tablets are all discoverable as peers when running our SDK. You can use these peers to trigger any application or database. If your app uses our SDK to collect radio fingerprints, anything can be automated or a second device running our SDK in the same spot can communicate with the first. In the past, you would need to pair Bluetooth devices or setup a phone in hotspot mode to communicate to nearby peers. The NewAer SDK enables short messages between devices that can be used to create experiences like we did with Unilever’s Magnum brand, or intelligent documents like we are building with Evernote, as Phil Libin announced at his SXSW 2015 keynote. We are proud to launch this code and look forward to see what you build on it! Head to our SDK download page and get started now! If you want to learn more about the Bluetooth Low Energy limitations of Android, read below. Announced with our CES 2015 press release, we’ve delivered on the promise to launch our latest SDK for Windows which uses Bluegiga (recently purchased by Silicon Labs) Bluetooth Smart dongles and supports the latest 5.x release of Android Lollipop! Our code for iOS has been updated as well, but does not yet contain WiFi reporting, so we are keeping that revision number at 4.x until that functionality is added. and…Most importantly, the codebase variables, parameters and arguments between all operating systems have near complete (with the exception of some OS limitations) parity between platforms. This means developers that work in more than one environment can use similar code or teams of programmers that develop within single platform environments will be able to collaborate more effectively on their proximity solutions using the NewAer SDK! Also, If you have been following this blog, you know that proximity services require an application on the device to read the radio waves that a phone can see at a hardware level in order to execute actions within an application. That alone is a daunting proposition for mass adoption. Well, the proximity world got exciting last week, as Facebook enabled iBeacon support within their mobile app giving – at current count – 745 million users the ability to see beacons. Now that user number is not broken out into iOS users vs Android, but technically Android can see Bluetooth Smart beacons on modern hardware as well, so the potential user base could be extremely large. We covered Facebook Place Tips with a guest post on the Beekn blog, a site that covers all things beaconing in the modern world. Our take was on making this a value add to those Facebook users, without making the technology spammy or heavy on marketing. Since Facebook and Apple only use Bluetooth Smart (BTLE) for their iBeacon protocol, it will be slow to roll out new beacon infrastructure in establishments. For us, this limitation opens up an opportunity. Since the launch of our first application in 2011 called ToothTag, NewAer has supported not just beaconing Bluetooth, but any radio wave – to create any interaction on a mobile device for Android, OSX and Windows plus a subset of supported radios on iOS. So now the WiFi access point or point of sale in your local coffee shop can become a software beacon. Thanks to the team at Beekn for publishing our Facebook Place Tips post, and the NewAer + Originate team for pushing 5.0! Developers, head over to our SDK page and show us your chops by digging into our 5.0 SDK! The 2015 Consumer Electronics show has wrapped and was jointly called the year of wearables and Internet of Things. In case you missed it, wearables are devices that you place on your body similar to a watch with a LED, LCD or sometimes electronic ink screen that can display data such as your steps walked, hours you’ve rested or even your heartbeat. They have wireless capabilities to transfer or sync between your smartphone which then can share the data to the Internet for your review or social media sharing. Internet of Things, abbreviated IoT by those in the know, are devices that you would put inside your house, such as a power outlet that is controllable from a hub or directly from a smartphone application, or a sensor on your front door to detect knocking or whether it is opened or closed. These typically talk via a type of low-power radio wave that your phone does not support, which requires a hub or bridge to get them onto the Internet, where they can then message your smartphone. These bridges span the gap between fast WiFi used by your high-power smartphone and computers vs tiny data IoT collectors that submit “basic payloads” to the Internet. We spoke at Wearable Wednesday on the Monster stage, and spent the majority of the week with Samsung and Intel in a suite along side other members of the Open Internet Consortium or OIC, showing how our platform can discover these IoT devices and kick off the communications or automated actions over the higher-speed and smarter device network data channel. The key to our solution is you do not need to pair to these beaconing devices or even unlock your phone, open up an application, otherwise tapping away on the screen for common actions that you may wish to be automated in your life. Examples of this are automatically opening the garage door when you drive within WiFi range of your home, or having media and lighting preferences follow you from room to room in your house. Our showcase demo included smart home devices from Philips, Honeywell, Atmel, and other major players, as well as some fun thrown in from startups like our Beacon Bar which we debuted at the Intel CEO summit. This tablet-based system shows how Internet of Things (IoT) elements can be added to ordinary items to create real-world interactions. In this case, it was liquor bottles that triggered messaging on nearby tablets on the bar-top of our suite to give relevant messages to our visitors. To make bottles “smart,” Bluvision beacons were placed into the “punt” of bottles (the dimple on the bottom) to trigger specific messages on a tablet for each spirit as they were seen by a tablet. The key to this demo is that it shows how we are able to focus the signal strength of an object and trigger an event at less-than a one-foot range based upon Bluetooth Low Energy or Bluetooth Smart as it is called by the Bluetooth Special Interest Group. This means that a Point of Sale (so called POS since this post is also about acronyms) on a tablet or Windows machine with our software developer kit can determine which customer is directly in front of the register. This capability can enable loyalty programs, payments or coupons to be automated from a consumer mobile phone or wearable. Beacons in the punt of liquor bottles identify the spirit poured at CES. Also at CES, we announced our SDK 5.0, which brings a suite of features into the SDK for all platforms, including using wearables to wake up and trigger applications built on our platform, much like an iBeacon would wake up an app inside of a store. You can read more about that from our press release here: NewAer announces its 5.0 SDK at CES 2015. And that wraps CES, while we are exhausted; we remain invigorated with the excitement that we heard from current and future customers at the show. We are excited to enable more beacon and iBeacon compatible projects into 2015! This week we are in Munich for the DLD conference where we are showing the airport of the future – where signs tell you where to go when you approach them, rather than you needing to study an airport eye-chart! If you are in Germany, drop us a note and lets chat about proximity! After the introduction of the word iBeacon at the 2013 Apple World Wide Developer’s (WWDC) conference, 2014 was the year of big companies dipping their toe into beaconing radio wave technology. For NewAer it was exciting to see so many international players utilize the SDK we have been perfecting for 4-years; even better, it was truly a record-breaking year for our company as we deployed our all mobile platform compatible Proximity Platform, which turns any mobile device into a beacon. Our software developer kit makes iPhones, iPads and even the now-unsupported Windows XP machines that run most of the digital signs that you see in malls, stores and airports compatible with Bluetooth Low Energy, the protocol used by beacons. We flipped the assumed paradigm of iBeacon in July with Deutsche Telekom. Rather than positioning beacons within a space and interrupting users on their mobile phones, we applied 700 beacons to guests name badges at the T-Labs 10th anniversary party in Berlin, Germany. This became a record-setting number of iBeacons within a single space. Apple tablets running the NewAer Kiosk application read the iBeacon machine ID, then pulled user identity and information from a Deutsche Telekom owned database to bubble up relevant information at the right time to party goers in front of this signage. The tablets were connected to huge flat-panels around the event which made it truly interactive. This system has been engineered to be private and dynamically responsive and is also what we built the American Airlines airport signage upon during our in-air hackathon. 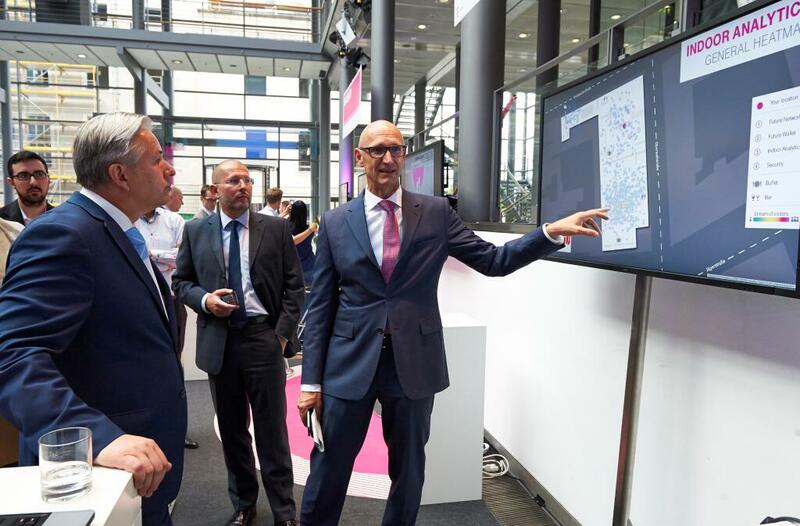 Klaus Wowereit Mayor of Berlin and Timotheus Höttges CEO Telekom showing the NewAer engine. In September, we debuted the iPhone application “M-Pulse” with Unilever’s Magnum brand – a first peer-to-peer + iBeacon app of its kind. What made this application unique is friends who downloaded the app would be alerted when another friend was nearby via the same app, and they would be rewarded with free ice cream when an iBeacon was also found on any nearby Magnum cooler. 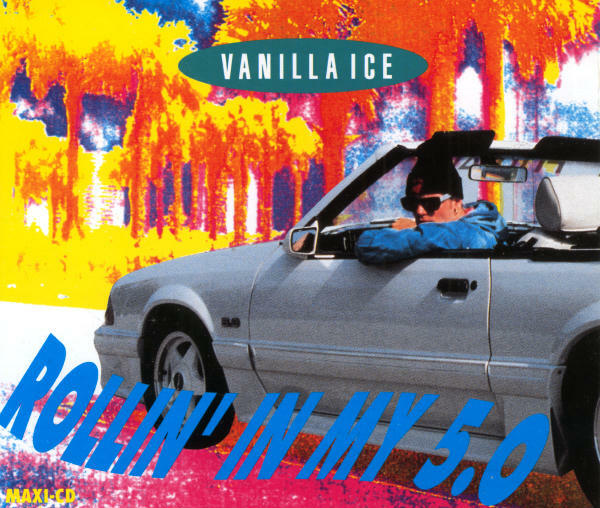 We called it the digital ice-cream social, with a mission to connect people as part of Magnum’s 25th anniversary. Look for further rollouts of this technology in 2015 within the consumer product brand marketing space! 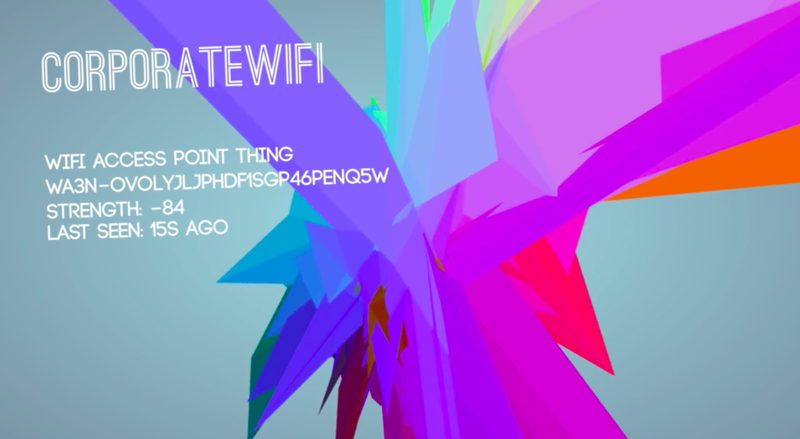 Also in September, @Stef debuted his Internet of Things inspired artwork “What do You Thing” based upon our platform. This OS-X application reads the radio signals our platform captures from wearables, Beacons, WiFi access points, printers and even older Bluetooth 2.0 devices to create a multi-dimensional visualization of the radio waves inside of a space. Look for more apps from Stef in the future on our platform! @Stef and his visualization of the Internet of Things. If you have ever read or posted on Craigslist Missed Connections, this next app is for you. The human herd naturally wants to connect, which is what our proximity platform can quickly enable as a low power and instant peer-to-peer machine layer. This fall, the application Cheekd launched using our framework to replay your social life based upon eligible bachelor and bachelorettes that you encounter during the day. When two people looking for a love connection get within a hundred feet of one another, their phones will let them know they are in range of a match based upon their configured preferences within the Cheekd application. It’s a magical experience and is powered by NewAer invisibly behind the scenes! And finally, beacons got fun with Intel at their Global CEO Summit in October, with the debut of the Beacon Bar – where the Internet of Things is tagged to bottles of your favorite spirits interacting with tablets. 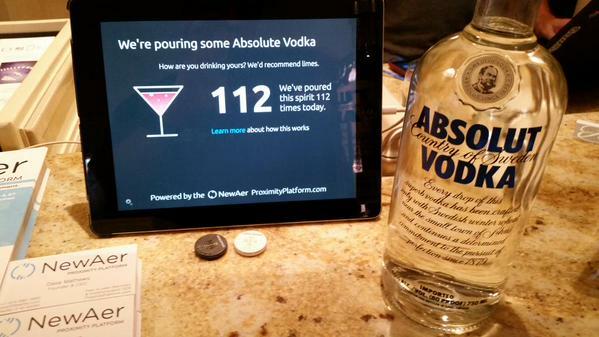 The spirit type, mixer suggestions and number of times the liquor was poured all automatically appear on a bar mounted tablet. This is based on our Kiosk application, and is available for your company or next party. Let us know if your interested! 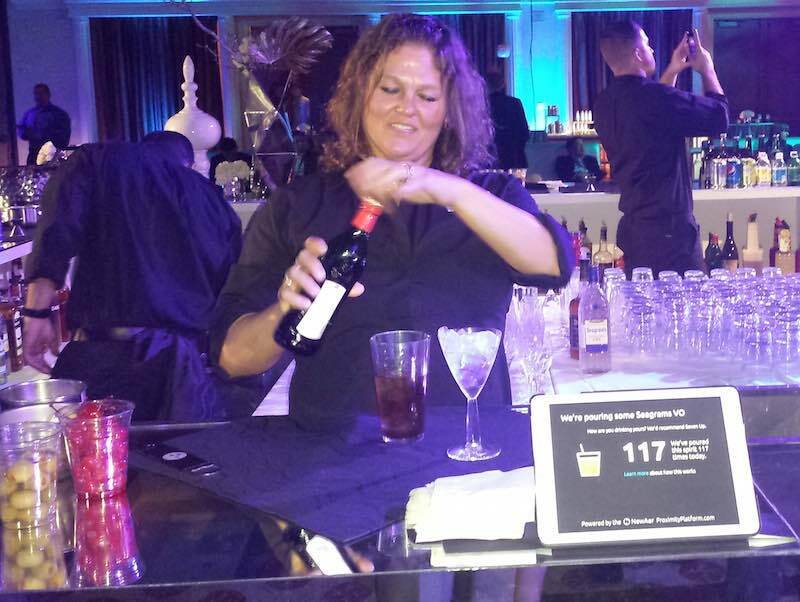 Bartender pours Seagram’s VO while the bar mounted tablet sees the beacon and automatically reacts. If you are in Las Vegas for CES, come visit us at the Open Interconnect Consortium where we bring the Beacon Bar to Sin City. To get an invite, just use the Contact form or email us at partners at newaer.com and we will see you at our happy hour on Tuesday evening at the Bellagio, or schedule a time to meet during the week. A huge thank you goes out to all of our innovative partners and their agencies who made the above happen and a happy new year to you! mWe are excited about 2015 being a mainstream year for our technology! If we don’t see you at CES, why don’t you download our SDK today and see what you can build upon it? As we run full force into the holday shopping season, we aren’t going to talk about beacons – you can read about that from our ’tis the season post from last year. This season of retail we found ourselves in London where we spoke at the Unbound Digital conference on the future of marketing in our mobile, digital world. The session that we moderated, Creativity & Innovation in Advertising had inspiration from three startups, ours plus two Israel founded. Tal Cholozen from Innovid and Tal Keinan from AdExtent were the digitially distruptive innovators. There were also some heavy hitters working at huge companies on the panel. Eric Salma from WPP’s 18,000 employee research group Kantar along with Khurram Hamid from GlaxoSmithKline digital. 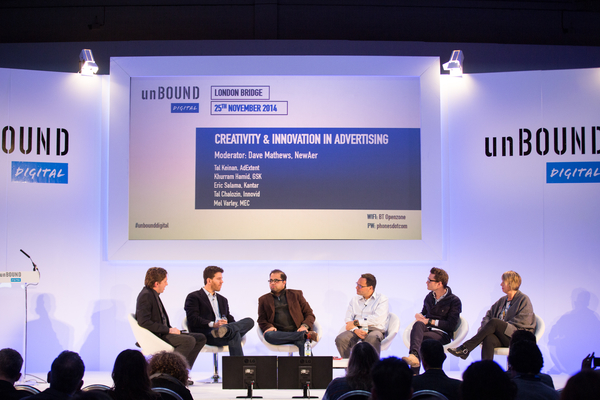 Finally, Mel Varley of GroupM company MEC UK’s Chief Strategy Officer rounded out the panel. You can see that 30 minute action packed session below. 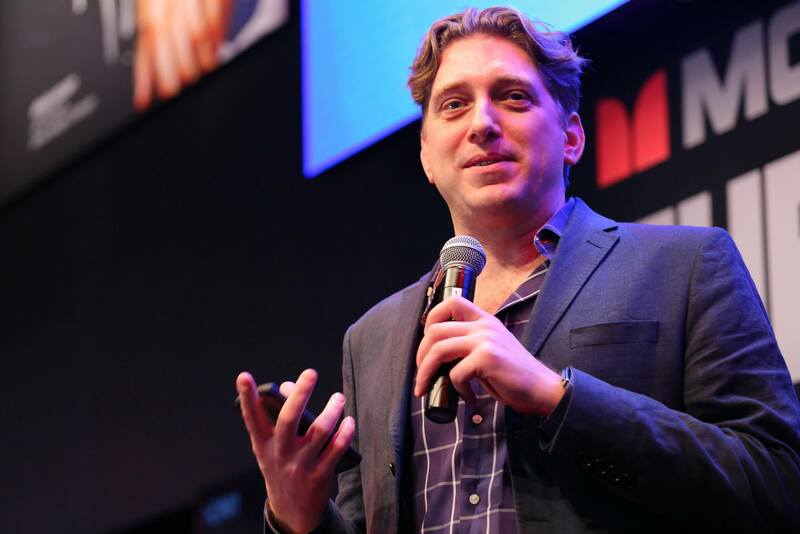 Additionally, on the session before ours, company friend and tech luminary Yossi Vardi moderated a panel which included Marc Mathieu who spoke about Unilever working with startups like ours, to enable new customer interactions with mobile devices. We cut to the relevant part at 22:50 in this video below, but you can rewind to watch the complete and interesting story. More to come on that project as well! Merry Christmas everyone!